This Christmas we are looking west. 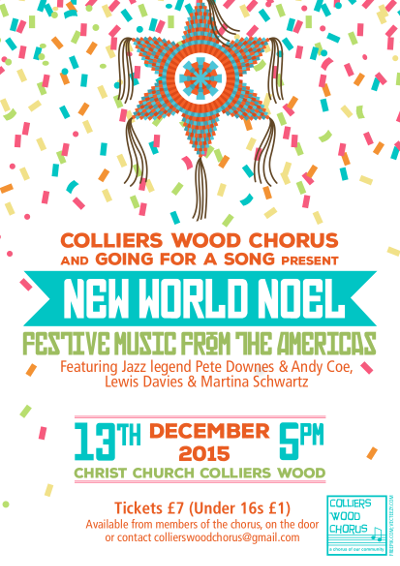 We're joined by Going for a Song Mitcham, legendary Jazz guitarist Pete Downes, Andy Coe on double bass, accordionist Martina Schwartz and Lewis Davies on percussion for our themed concert of Chistmas Music from the Americas. The programme will start with the charming Argentinian Christmas mass Navidad Nuestra, which will be performed as originally written rather than the European-adapted version more commonly heard. We will then head northwards through Mexico into North America for some more familiar festive favourites. If this concert doesn't have you Dreaming of A White Christmas then nothing will! A leaflet will be provided containing translations. Tickets are £7 for adults and £1 for children, available in advance or on the door. Refreshments are available beforehand and during the interval.